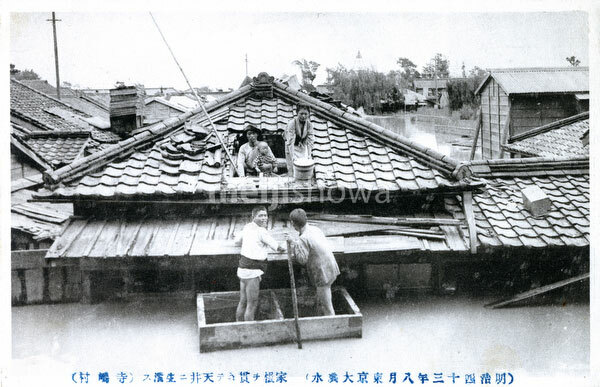 Terasaki-mura inTokyo during the flooding of August 11, 1910 (Meiji 43). This disaster is now known as the Great Kanto Flood (関東大水害, Kanto Dai Suigai). The flood, caused by a storm, submerged more than 201 square kilometers and over 170,000 dwellings and buildings. There were 1,349 dead or missing. It was Tokyo’s third worst flood disaster of the 20th century. The disaster prompted an unprecedented response from the Japanese government. An extraordinary flood control investigation council was set up to discuss measures to prevent flood disasters and the following year Japan’s “First Flood Control Plan” was authorized.